Intellinet, a management consulting and technology services firm, is honored to announce its recent inclusion in Consulting Magazine's annual list of Fastest Growing Firms. 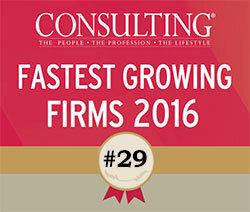 Consulting magazine's Fastest Growing Firms is a global list that honors consulting firms of all sizes and of any sector. Firms are ranked by their rate of revenue growth between 2012 and 2015. Intellinet came in 29th on the list. "We are thrilled to be recognized as one of Consulting Magazine's prestigious list of Fastest Growing firm" said Mark Seeley, chief executive officer of Intellinet. "We believe when we operate well, we can invest in our people, take bets on innovations and new offerings, show strong thought leadership to our clients, and give back to our community." Intellinet and the rest of the Fastest Growing Firms were honored in a ceremony at the annual Consulting Summit in New York on Thursday, October 13, 2016. To see the full list of honorees, click here.